Departing Edinburgh in the early afternoon, journey north through the former Kingdom of Fife, then up into the dramatic scenery of the Highlands. In the evening an informal dinner is served, followed by entertainment in the Observation Car. Overnight in Boat of Garten. After breakfast, you travel by coach to Rothiemurchus Estate in the heart of the Cairngorms National Park. Rothiemurchus offers a magical setting in which to try a spot of clay-pigeon shooting or fishing or a tour of the estate. Rejoin the train for lunch and travel to Culloden Battlefield for a private tour. Enjoy an evening visit to Strathisla Distillery, one of the oldest working distilleries and home to one of Scotland's most famous whiskies. 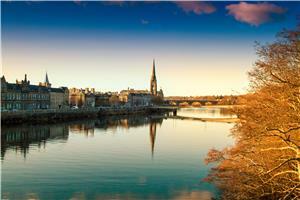 Back on board enjoy some spectacular panoramas on the way south through Aberdeenshire and Angus. A formal dinner is served on the way to Dundee. Enjoy a leisurely breakfast as you leave Dundee behind and return to Edinburgh.